2013 already saw a glimpse of this off-topic. Non-neotropical land snails, mainly European, in old books and manuscripts; some recognisable, others not more than a rough sketch. You might say, what’s so funny about them? Yet, it turned out to be an intriguing hunt. Perhaps first how I ended up here anyway. Working on a manuscript on Cuban Liguus, the question arose if their murky taxonomy perhaps had been influenced by early pictures. This started off an iconographic search for old pictures of these often colour-full tree snails in shell books. Having finished the manuscript together with Luis Álvarez and Adrián González, I suddenly realised that I had seen a similar shell on a painting. Starting searching rather quickly revealed one on this oilpainting of Balthazar van der Ast, A Dutch painter who worked in the early 17th century in Utrecht and Delft, but was trained in Middelburg by his father-in-law Ambrosius Bosschaert the Elder. Questions came up: Was this the only example of a Liguus shell on a painting? If not, which other tropical species have been used? By whom, and when do they start appearing on painting? And where originated these paintings? To dig up answers more art historian expertise and data were needed. Found them in my collaborator Susan de Heer and at the Netherlands Institute of Art History, which has a huge archive of pictures (partly online) and a well-supplied library. Now the hunt was on, both on-line and off-line. Besides art historical reflections (e.g. 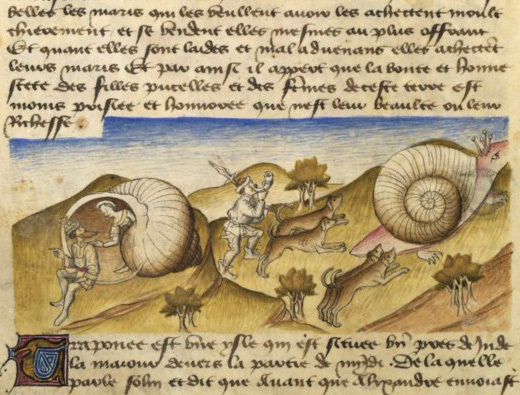 the symbolic meaning of a snail), not my expertise at all, I soon wondered about other questions: Have land shells in general been used by artists on paintings? On other works of (visual) arts? When did this start? Did they accurately picture a shell or snail, or were these merely generalised illustrations? If they seemed more accurately figured, what would be the best guess about their identification? LeGoff, J. (1999). Un autre Moyen Age: 1–1404. Gallimard, Paris. This entry was posted in Uncategorized and tagged biohistory, blogging on January 2, 2014 by bramb. Some years ago I continued my blog – of which the old posts are still available on my website ashbreure.nl – to the weblog posting site Posterous. I thought: given the in-built features both convenient for you as reader as well as practical for me. Some weeks ago I discovered that Posterous, the company being sold to Twitter, is just a quick bird, flying away with the winds. Out of the blue not being able to post any news, I was left quite stupefied. The only thing they did decently was offering the availability to back-up your blog and to download it. This entry was posted in Uncategorized and tagged blogging on February 22, 2013 by bramb. Still in its infancies, a Network for Neotropical Biogeography is being formed now to stimulate scientific interaction and promote inter-disciplinary cooperation (among other aims). Although so far the network seems to consist mainly of botanists, I hope it will reach its goal to stimulate contact between different fields of interest. Publications and images can be easily exchanged between interested scientists and probably lots of potential just need further to develop. Good initiatives always need to be plugged, so here it goes. This entry was posted in Uncategorized and tagged biogeography, blogging, contacts on September 23, 2011 by bramb. Away for a break, back beginning of June. This entry was posted in Uncategorized and tagged blogging on May 20, 2011 by bramb. The New Year is always a good opportunity for a review on the past and a preview to the next year. 2010 has been busy and hectic personally and professionally. All together I have been nearly four months abroad, with major trips to South America, America, London, and Brussels. These have stimulated my research, but the published results are still pending. All together I published four papers, one book review, and had two posters presented. My blog had regular updates, both on it’s old site (www.ashbreure.nl) as well as here. The number of page loads and visitors for my website has grown compared to 2009, and during the two months at Posterous there were 1942 site views. With the formal fusion of Naturalis, the Zoological Museum Amsterdam and the National Herbarium into NCB Naturalis at the beginning of 2010, the challenge for 2011 is to make the change happen. The integration of the Mollusca collections of Amsterdam and Leiden will start in May, with an experimental Live Science exhibition in the museum. It will be a major operation, which will limit the access to the collections. This entry was posted in Uncategorized and tagged blogging, varia on January 2, 2011 by bramb. What is simpler than a name? The iPhylo blog had a few days ago a post about the relevance of taxonomic names (http://iphylo.blogspot.com/2010/10/are-names-really-key-to-big-new-biology.html). Do we need names? According to this blogpost, “formal taxonomic names don’t seem terribly necessary in order to do a lot of science“. This opinion was underpinned by referring to surrogate names (like ‘SAR-11’), which are commonly used in experimental studies. In many cases this may be appropriate, but if you have read my blogpost of yesterday, I would like to say: “think it over, it’s not that simple”. This blogpost by Roderic Page continues by stating that names could be managed very simply if we had a complete bibliography of of group in a database, the combination of name and document would be enough to create a timeline of usage. Note the word ‘if’… A big proviso. There are a few wrinkles to deal with. Firstly, names may have synonyms, lexical variants, etc. (….). Leaving aside lexical variants, what we want is a “view” of the [name,document] pairs that says this subset refer to the same thing (the “taxon concept”). We can obsess with details in individual cases, but at web-scale there are only two ones that spring to mind. The first is the Catalogue of Life, the second is NCBI. The Catalogue of Life lists sets of names and reference that it regards as being the same thing, although it does unspeakable things to many of the references. In the case of NCBI the “concepts” would be the sets of DNA sequences and associated publications linked to the same taxonomy id. Whatever you think of the NCBI taxonomy, it is at least computable, in the sense that you could take a taxon and generate a list of publications ‘about” that taxon. So, we have names, [name,document] pairs, and sets of [name,document] pairs. Simples.“. Unquote. This entry was posted in Uncategorized and tagged blogging, taxonomy on October 27, 2010 by bramb.